This card is part of my April Class Kit featuring the Parisian Breeze Designer Series Paper and items from the Pretties Kit. 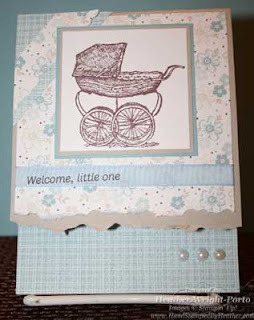 I used a baby stamp from a retired set "Buggies and Booties" but you can really use any stamp. This card also features the Tearing Tool (not part of the kit). As part of the Kit, all the paper is already pre-cut and pre-scored for you! All you have to do is stamp and assemble. Ribbon and pearl are also included in the Kit. This card can be done in one of two ways. If I sent you a piece of Whisper White cardstock or if you have Whisper White cardstock at home and want your card to "stand" on it's own (I'm using a stand in the picture above), then follow the instructions below. Adhere the blue/white patterned paper to the Whisper White card front. You can adhere the 3 white pearls now or later using Mini Glue Dots. Tear the Sahara Sand piece of paper, then adhere on top of card front. Tear the large floral patterned piece of paper, then wrap a piece of ribbon around the piece and adhere behind. Then adhere this piece to the card front leaving some of the torn Sahara Sand piece showing. Then stamp an image in Chocolate Chip Classic Ink on the Whisper White square piece, then layer on the Sahara Sand piece, then adhere and layer on the Baja Breeze piece. Set aside -- this will be the last thing to adhere. Adhere the triangle in the upper left corner. From the paper torn from the large floral patterned piece of paper, now tear a small, thinner piece and adhere to the triangle. Then manually snip the edges on a slant once adhered. Now adhere the stamped image (and layered panel) to the card front. Last but not least you can either stamp a greeting on the ribbon or use a rub-on as I did above. This is the original card design that will NOT stand on it's own. Same as above except there is no Whisper White card. Instead Sahara Sand makes up the main card and is torn at the bottom, front of the card only (that is why the card cannot stand on its own). Then adhere the small blue/white patterned piece to the bottom of the inside of the card front. Adhere pearls with Mini Glue Dots.